I had my first camera when I was three years old. All I knew at the time was to hold it to my face, close one eye, and push on it somewhere. From then until college, I tried everything from a Transformers camera with flash cubes, to a point and shoot film camera. Family gatherings served as my testing ground for each one of them. During college, I upgraded to my first SLR camera which allowed me to change lenses and add accessories. I only had one lens at the time, but those years gave me the opportunity to learn my equipment and discover why I received certain results... both good and not so good. This knowledge has transferred to the professional equipment I use today, and has helped me better understand how to see and capture light. I now view my camera as simply a tool that allows me to capture what I see with my own eyes. I consider myself to be a storyteller with a camera. I use my camera to create images, similar to how a writer uses a pen to write thousands of words. Why did I choose to become a photographer? It's simple... for the moments. 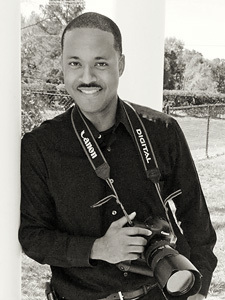 The essence of what I capture comes from clients who give me the freedom to archive incredible moments of their lives. Whether I have to kick off my shoes at a wedding, climb furniture to get the best angle or photograph in the pouring rain, I’m absolutely game if you are. I love to travel and welcome the opportunity to experience locations that are just a road trip or plane ride away.